Kathryn Fisher is a PhD candidate in the department of International Relations at the London School of Economics and Political Science. Her thesis "From the Troubles of the Late 20th Century to 21st Century International Terrorism: British counterterrorism, securitization and identity in historical perspective” aims to better understand the relationship between processes of identity construction and successful justifications of exceptional counterterrorism. After over two decades of renewing temporary counterterrorism laws in Britain from the early 1970s, making such measures permanent with the Terrorism Act 2000 was not necessarily a predictable or predetermined outcome. The Northern Ireland peace process was underway, the Labour party who had voted against temporary counterterrorism laws for over a decade was newly back in power, and historical context pointed to an inconclusiveness around how effective such laws actually were in reducing insecurity. In this article I argue a key element helping explain this transition from temporary to permanent counterterrorism law lies in how particular threat and referent identities were constructed in official British discourse. Drawing on empirical research from a relational-securitization analysis of official British discourses from the late 1960s to the present, this paper argues that processes of identity construction were essential to introducing and justifying the Terrorism Act 2000. The deployment of particular threat and referent labels established in discourse before events such as 9/11 or 7/7, such as “international” terrorism, helped enable the shift from counterterrorism law from temporary emergency response to permanent policy practice. There have been few mistakes bigger or more durable than the PTA [Prevention of Terrorism Act]. Its powers of exclusion, arrest and seven-day detention, the miscarriages of justice to which it gave rise and its powers of stop and search at the ports have alienated generations of Irish people and assisted the IRA with its recruitment from the nationalist community in Northern Ireland. As the House will be aware, the Government propose the introduction of permanent counter-terrorist legislation, which we hope will do away with the need for the annual renewal of temporary provisions…Terrorism, and the threat of terrorism from a range of fronts, is likely to continue to exist for the foreseeable future. The largely permanent counterterrorism laws in Britain starting with the Terrorism Act 2000 were not necessarily a predetermined outcome considering the historical context and political backdrop preceding them. There remains no commonly understood definition of terrorism to guide lawmakers and factors at the time such as material evidence of risk and political party positioning did not automatically point to making temporary domestic counterterrorism laws permanent practice. As such, especially considering tensions between civil liberties, human rights, national security and the increasingly normalized presence of such laws needs to be investigated with historical and analytical care. In this article I argue a key element helping explain this transition from temporary to permanent counterterrorism law lies in how particular threat and referent identities related to terrorism were constructed in official British discourse. The way to study securitization is to study discourse and political constellations: When does an argument with this particular rhetorical and semiotic structure achieve sufficient effect to make an audience tolerate violations of rules that would otherwise have to be obeyed. Securitization theory strengthens relational investigations of counterterrorism law by encouraging inquiries into what security does instead of just what security is. This supports research on terrorism focusing not only on material issues of concern, but also on how socially constructed issues of identity affect outcomes in security policy. However, rather than survey the entire period from this broader study or go into further research design specifics, this article focuses on one particular temporal snapshot: the late 1990s and transition from the temporary Emergency Provisions (Northern Ireland) Act 1973 (EPA) and Prevention of Terrorism (Temporary Provisions) Act 1974 (PTA), to the permanent Terrorism Act 2000. Primary empirical sources are legislative acts with “terror” explicitly in their language, parliamentary debates surrounding the introduction and passage of these laws, and parliamentary research papers and reports. Secondary source material came largely from historical research related to Northern Ireland as well as research on counterterrorism more generally. Of specific interest for this article’s temporal focus and transition to permanent counterterrorism law are the EPA, PTA, Legislation Against Terrorism Consultation Paper (Cm 4178), Terrorism Act 2000, and parliamentary debates surrounding these texts during the 1990s. After briefly discussing historical and material context related to British counterterrorism, the article will summarize how processes of threat/referent construction observed in official British discourses were key elements to enabling temporary counterterrorism law be made permanent policy. The conclusion will then discuss why a focus on issues of identity matters for research and practices of counterterrorism law. By the nineties, after almost two decades of renewing temporary counterterrorism laws, there was still no official consensus on whether or not key acts at the time (PTA and EPA) were especially effective. Ongoing violence was interpreted both as a need for counterterrorism law to continue, as well as counterterrorism law failure. In addition, the Downing Street Declaration from 1993, paramilitary ceasefires from 1994, prison release schemes from 1997, Good Friday (Belfast) Agreement in 1998, and overwhelming disapproval of the 1998 Omagh bombing, all contributed to beginning public processes of desecuritization related to terrorism in Northern Ireland. To say “desecuritization” is by no means to say there was no longer a threat to security in Northern Ireland. Rather “desecuritization” indicates how the perception of that insecurity and associated threat identities was shifting from a language of “terrorism” to one increasingly aligned with “dissident”. Whether reflecting on Omagh (29 killed, over 200 injured) or the killing of human rights lawyer Rosemary Nelson, a risk of violence and sense of insecurity persisted. Despite this continuing risk, processes of threat/referent construction securitizing terrorism repositioned particular identities to minimize the threat from “Irish related” terrorism, instead bolstering the danger of “international” terrorism. These reconstructions of threat identity reinforced a shift in perspective on what terrorism “was”, helping enable a major shift in counterterrorism law. While domestic and international insecurities remained, such issues did not necessarily appear as existential threats requiring temporary counterterrorism laws introduced, as emergency measures needed to be accepted as permanent policy. Most high profile attacks unconnected to Northern Ireland referenced in official discourses were not directly against Britain. Instead, they were often connected to specific groups and targets, conceivable to interpret as one-off horrors rather than imminent threats of terrorism to a particular British referent. A 1994 car bomb outside the Israeli embassy and Balfour House in London, 1997, Luxor tourist attack in Egypt, 1998, Johannesburg restaurant bombing in South Africa, and 1998 U.S. embassy bombings in East Africa, are all evidence of political violence, but not necessarily an indication of an existential threat demanding Britain establish permanent domestic counterterrorism law. The Labour Party continues to believe that emergency legislation cannot resolve the problems which exist in Northern Ireland. Furthermore, the grievances to which the operation of emergency powers give rise are in themselves one of the causes of the continuing violence. Thus while having Labour in power clearly could have been a catalyst to remove temporary counterterrorism laws and instead focus on existing criminal law or international cooperation, what we see is quite the opposite. Not only did Labour introduce legislation collapsing the PTA and EPA into the single, UK-wide, Terrorism Act 2000, but they also began an array of other institutional changes furthering the permanence and normalization of exceptional counterterrorism more broadly. There continued to be public disagreement over counterterrorism law effectiveness considering miscarriages of justice, construction of suspect communities reinforcing sentiments of alienation, and a continuing lack of trust between communities and law enforcement. These consequences, especially when combined with an overall consensus on Northern Ireland that “negotiated political settlement is--as we are all agreed--the only way forward”, could have encouraged moving away from counterterrorism law rather than making such laws permanent. With historical context and political positioning unable to fully explain the transition to permanent counterterrorism law, this leads us back to the article’s focus on repositioning inquiry on issues of identity and discourse. An essential factor to this change in legal trajectory, introduced by Labour with the Terrorism Bill and Legislation Against Terrorism Consultation Paper in 1998, rests in the particular ways threat and referent identities were constructed in official British discourse. Processes of securitization helped enabled and justify permanent counterterrorism law by newly distinguishing three terrorist others in official discourse: domestic, Irish, and international. To move from temporary measure to permanent law while also beginning public negotiations with actors recently considered “terrorists”, threat/referent labels necessary to successfully securitize terrorism had to be reconfigured. The threat was reconstructed and repositioned in official discourse to establish new borders around who were, and were not, illegitimate terrorist actors. Previous “others” were yoked to legitimate politics, highlighting a new acceptance of former threats (for example Gerry Adams to John Hume, Sinn Féin to the SDLP), with discursive spaces around identity then redesigned to allow new terrorist threat labels to arise (domestic, Irish, international). Terrorism is not a self-evident, exceptional category of political violence. Rather, it is a social construction – a linguistic term or label that is applied to certain acts through a range of specific political, legal and academic processes. This is not the same thing as saying terrorism is not real; there are real people causing real harm and death to other real people. Instead, it is to say that the meaning of (and subsequent responses to) those real acts of violence is determined by a complex series of social and political practices which contribute to the labeling and categorization of events. These relational processes of labeling have substantial symbolic and material effects. Considering how terrorism has transitioned over time in collective meaning to embody the ultimate illegitimate use of violence, calling something terrorism can invoke unquestioned uses of state force. A democratic rhetoric of terror shuts down opposition described as “soft on terrorism”, bolstering exceptional state response as increasingly normal. In short, labeling political violence terrorism not only affects intersubjective structures of understanding around what particular risks “are”, but also the spaces for possible agency during policy-making that enable what types of security response is possible. When introduced during the Troubles in the early 1970s, British counterterrorism law was viewed as highly exceptional, aimed at “the defeat of terrorism and the extension of normal policing”. Such powers were “unprecedented in peacetime”, necessary to “enable preventive action to be taken against people who appear to the Secretary of State to be involved with terrorism but against whom it is not possible to bring charges under the present law”. To justify making those laws permanent then it was essential to establish the threat as more serious and dangerous than “ordinary” criminals, as unquestionably illegitimate. At the same time, discourses and policy could not be seen as losing touch with historical, social and political roots underneath much of the violence, nor could they be seen as ignoring international conventions on human rights. The increasingly elusive nature and heightened danger of terrorism as constructed in discourse helped satisfy both of these requirements. The securitization of terrorism in official British discourses of the 1970s constructed terrorism as a serious threat to the maintenance of peace and order, stemming from hooligan gangs and subversive unrest. This contrasts with 21st century discourses constructing terrorism as ever-changing, threatening the referent’s very way of life in addition to its right to life as such, reaffirming how “something about terrorism makes its threat inflate, genie-like, way beyond its actual physical scale”. By the late 1970s and early 1980s, the threat was established as distinct from ordinary crime but encompassing a similar lack of political or moral legitimacy. This aligned with a government committed to hardline policies and increasing processes of criminalization generally. Such processes were indeed referenced by opposition during debates on counterterrorism law, “that the record of the past 13 years shows that the Tory Government have been no more successful in their battle against terrorism than in their fight against crime”. Irrespective of this comparison, majority opinion on counterterrorism was left unchanged, and the renewal of temporary counterterrorism laws would continue. By the mid 1990s, the securitization of terrorism in official British discourses was again shifting. Processes of threat construction divided terrorism into three forms, Irish, domestic, and international, while expanding the danger of terrorism generally, paving the way for permanent counterterrorism law. Terrorism was simultaneously being broadened and narrowed in official discourse. On the one hand it was expanding with a language of “terror” increasing in overall frequency. At the same time, the threat was narrowed into three forms bolstering a perceived entity-like character, regardless of labels such as “international terrorist” ultimately dependent upon indeterminate boundaries. This image presents us with 21,415 hits for “terrorism” during the 1900s. 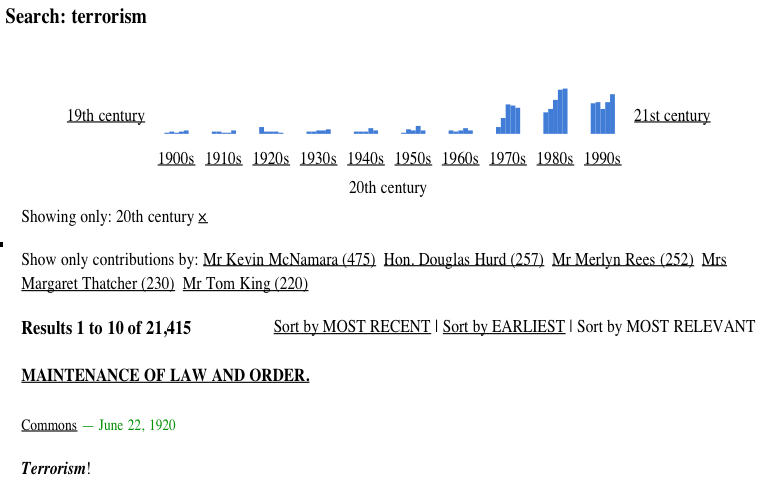 The earliest “terrorism” hit is seen in 1920, under the subject of “Maintenance of law and order”, while the end of the century leads to a substantial increase in usage more broadly. A search of “terror” and “terrorist” in the nineties alone resulted in 6300 and 6218 hits respectively. If parliament met 365 days a year, which they did not, that would mean “terror” was rhetorically deployed on average over 17 times each day during debate. However, despite the impact this change in frequency may have on our picture of terror in official discourse, such results should not be interpreted as some kind of analytic revelation. It is not merely the frequency of a term that indicates its influence (or not) on counterterrorism law formation and justification. It is also how that term is situated in the discourse, and what intersubjectivities such position and terminology then substantiate. Peter Brooke (Conservative): Nevertheless, simply because the crimes committed by terrorists are so heinous, because they are such an affront to human decency and to the civilised values that we share with our friends throughout the world, and because these terrible deeds move us to great and justified anger, I should like to make clear to the House the Government's strategy to defeat terrorism and to explain how the Bill is an integral part of that strategy…For terrorism, by its very nature, represents a relapse into barbarism and savagery that unites the entire civilised world in determined and unquenchable opposition. Such issues of illegitimacy and morality surrounding terrorism intensified over time, with the threat presented not just as brutal, but evil, the referent not just Britain, but civilization and democracy. Jack Straw (Labour): Our commitment to the rule of law is one of the crucial differences between the principles of democracy and the evil dogma of the terrorists. By positioning essentially uncontestable, yet vague, notions of good and evil around particular threat and referent constructions, alternative responses to proposed permanent counterterrorism laws were politically unsustainable: Who can explain any disagreement to fighting the evil of terrorism aimed at destroying a democratic way of life? Actors were rhetorically coerced into accepting a position they would perhaps otherwise reject. The discursive delineation of inside/outside borders along Irish, domestic, and international labels of terrorism combined with these commonplaces of immorality to exacerbate practices of inclusion and exclusion, reinforcing problematic us/them boundaries while limiting policy choices. Jack Straw (Labour): He [Lord Lloyd] concludes that the reason why terrorism produces that singular horror and revulsion is that terrorist crime is seen as an attack on society as a whole, and our democratic institutions. It is akin to an act of war. Those are powerful words, but they accurately define the nature of terrorism and the threat that it poses to our society. The late 1990s represent an important shift in how terrorism was constructed in official British discourse, helping legitimize the transition from temporary to permanent counterterrorism law. Intersubjective structures underpinning the securitization of terrorism affected material counterterrorism law outcomes by stabilizing threat and referent identities through particular deployments of rhetorical commonplaces and framings. Constructing Irish, domestic, and international terrorist labels changed the rules of the game, yoking previous threats to legitimate political actors, thereby redesigning intersubjectivities around terrorism to justify a shift to permanent counterterrorism law. How threat identities are constructed matters not only for material counterterrorism law, but also for collective understandings of identity related to these laws stretching beyond the realms of policy-making. Processes of threat/referent construction around terrorism produce counterproductive results such as the establishment of suspect communities, increasing the alienation and insecurity of already marginalized groups. As assumed borders of terrorist forms are sometimes taken to be objective representations, categorizations of identity may bolster unhelpful, or even damaging, collective understandings and actions. The division of terrorism along three identity labels in official British discourses should not be accepted as inevitable. Instead, such identities and practices need to be analytically problematized as a product of historically contingent process and social construction. Instead of constructing three particular terrorist identities, officials could have defined the threat by methods of violence. This would have perhaps acknowledged security concerns without provoking problematic boundary assumptions inherent to labels such as international, domestic, or Irish. Or, officials could have focused on specific actors such as Al Qaida, instead of using labels such as “international” that are forever open to interpretation and potential misappropriation. The point is not to advocate a particular policy position, but to highlight the socially constructed nature of threat labels and demonstrate that alternatives were possible: the way relations unfolded around terms such as “international terrorism” and the Terrorism Act 2000 was not the way it had to be. How does language sustain particular stabilizations of the ultimately undefinable threat of terrorism, and how are such stabilizations reconfigured or renegotiated over time? It is clear that 21st century constructions of terrorism have intersubjective roots in processes of identity construction beginning well before 9/11 or 7/7 as is frequently assumed. With changing context able to reinforce intersubjective understandings of identity from prior discourse, socially constructed boundaries can take on the appearance of objective durability. This durability may take hold irrespective of historical precedent or practical effectiveness, and requires further analytic pause, reflection, and inquiry. Even while acknowledging this potential risk of durability from socially constructed labels, there are key junctures in history when substantial redirections in discourse and policy-making take place. While structures of meaning establish certain constraints on political agency over time, as seen through rhetorical coercion, this does not mean agency is completely removed. To imply that structures of understanding around identity eliminate agency would be to mistakenly remove responsibility, accountability, and choice from political decision-making. An interesting and potentially quite important example of policy moving away from earlier discourses of threat/referent construction can in fact be seen in recent developments in UK counterterrorism. On the heels of recent counterterrorism reviews supporting a reduction in pre-charge detention time and lapse of control orders, the latest version of CONTEST released in July of 2011 has made a clear departure from discourses of terrorist threat labeling in previous versions. Rather than keeping the title from its 2006 and 2009 forms, “CONTEST: The United Kingdom’s Strategy for Countering International Terrorism”, it now reads “CONTEST: The United Kingdom’s Strategy for Countering Terrorism”. The word “international” has been removed from the strategy’s title. Though it is still deployed in the main text, this changed title dramatically repositions dominant patterns of terrorist threat construction in official British discourse. This shift demonstrates how even as particular patterns of threat/referent construction (such as “international terrorism”) promote certain structures of understanding over others, such structures are not insurmountable or deterministic of an actors’ agency: Renegotiations of structures, identities, and policy directions can, and do, occur. In addition to observed material elements of security risk, discourses of threat and referent construction play a large role in how counterterrorism laws are introduced, formed, and justified. Processes of identity construction greatly influence structures of meaning around issues of security and insecurity. These structures influence not just the collective understanding of what a security risk is perceived as “being”, but also in what way such a risk can and should be responded to. As such this mutually constitutive relationship establishing the need for and substance of particular measures affects not just legal substance, but also the vocabularies and meanings informing how we understand insecurity beyond official policy-making. Further research into relational underpinnings of threat/referent construction during securitization would encourage continued discussions on how counterterrorism laws are established, normalized, or revisited. Focusing on the social construction of identity around counterterrorism law would acknowledge the material and symbolic effects of labeling, as well as open up space for alternative inquiries into our research and practice of counterterrorism. I would like to thank Barry Buzan, Richard English, Patrick Thaddeus Jackson, Richard Jackson and George Lawson for invaluable support on work contributing to this article. In addition I would like to thank two anonymous reviewers for their very helpful comments, and Gillian Duncan for assistance throughout the submission process. Gearty, Conor and John Kimbell. (8 March 1995) ‘PTA renewal repeats one of the biggest mistakes, The British government asks parliament to renew the Prevention of Terrorism Act today. It is a 'pernicious' law, argue Conor Gearty and John Kimbell,’ The Irish Times, City Edition, available via www.lexisnexis.com. HC Debs, Vol. 327, col. 999 (16 March1999), http://hansard.millbanksystems.com/commons/1999/mar/16/prevention-of-terrorism#S6CV0327P0_19990316_HOC_500. This larger study represents graduate work in progress (For more information please contact k.m.fisher@lse.ac.uk). For introductions to relationalism see Jackson, Patrick Thaddeus and Daniel H. Nexon. (1999) Relations Before States: Substance, Process and the Study of World Politics. European Journal of Journal Relations. 5(3) pp.291-332; and Emirbayer, Mustafa. (1997) Manifesto for a Relational Sociology. The American Journal of Sociology. 103 (2) pp.281-317. For introductions to securitization see Buzan, Barry, Ole Waever and Jaap de Wilde. (1998) Security: A New Framework for Analysis. Boulder: Lynne Rienner Publishers Inc., Waever, Ole. (1995) Identity, Integration and Security: Solving the Sovereignty Puzzle in E.U. Studies. Journal of International Affairs 48(2) pp.389-431. Waever, Ole. (1998) Securitization and Desecuritization. In Ronnie Lipschutz (Ed.) On Security. New York: Columbia University Press., and the August-October 2011 special issue 42 of Security Dialogue on securitization. For further reading around issues of identity, security, and international relations see Albert, Mathias, David Jacobson and Yosef Lapid. (2001) Identities, Borders, Orders: Rethinking IR Theory. Minneapolis: University of Minnesota, Bially Mattern, Janice. (2005) Ordering International Politics: Identity, Crisis, and Representational Force. New York: Routledge, Campbell, David. (1998 ). Writing Security: United States Foreign Policy and the Politics of Identity (Revised Edition). Minneapolis: University of Minnesota Press, Hansen, Lene. (2006) Security as Practice. New York: Routledge, Jackson, Patrick Thaddeus. (2007) Civilizing the Enemy. Ann Arbor: University of Michigan Press, Jackson, Richard (2005). Writing the War on Terrorism: Language, Politics and Counter-terrorism. Manchester: Manchester University Press, Neumann, Iver B. (1999) Uses of the Other: “The East” in European Identity Formation. Borderlines Volume 9. Minneapolis: University of Minnesota Press, and Salter, Mark B. (2003) Rights of passage: the passport in international relations. London: Lynn Rienner Publishers, Salter, Mark, Ed. (2008). Politics at the Airport. Minneapolis: Regents of the University of Minnesota. While not presented in depth through this article considering space restraint, particular relational mechanisms used as tools in the broader study are framing, brokerage, yoking, and rhetorical coercion. For further detail on these mechanisms if interested see McAdam, Doug, Sidney Tarrow and Charles Tilly. (2001) Dynamics of Contention. Cambridge: Cambridge University Press (framing and brokerage), Abbott, Andrew. (1995) Things of Boundaries. Social Research. 62 (4) pp.857-882 (yoking), and Krebs, Ronald and Patrick Thaddeus Jackson. (2007) Twisting Tongues and Twisting Arms: The Power of Political Rhetoric. European Journal of International Relations. 13 (1) pp. 35-66 (rhetorical coercion). Buzan et al. 1998: 24-25. See Buzan, Barry. (2007 ). People, States & Fear: An agenda for international security studies in the post-cold war era. Essex: ECPR Press (Harvester Wheatsheaf, 1991) for work broadening and deepening the field of security studies along similar lines of what security does instead of just what security “is”. Emergency Provisions (Northern Ireland) Act 1973 (c. 53), http://www.legislation.gov.uk/ukpga/1973/53/contents (last accessed 30 October 2011). Prevention of Terrorism (Temporary Provisions) Act 1974 (c. 56), http://www.legislation.gov.uk/ukpga/1974/56/contents/enacted (last accessed 30 October 2011). Terrorism Act 2000 (c. 11), http://www.legislation.gov.uk/ukpga/2000/11/contents (last accessed 3o October 2011). Jackson, Richard. (2005) Writing the War on Terrorism. Manchester: Manchester University Press; Kurth Cronin, Audrey. (2009) How Terrorism Ends. Princeton: Princeton University Press; Townshend, Charles. (2002) Terrorism: A Very Short Introduction. Oxford: Oxford University Press; and Government and Opposition Volume 42, Isssue 3 (Summer 2007). See Hansard (1803-2005) for all debates, accessible via http://hansard.millbanksystems.com/. HC Deb Vol. 187 cc.31-36 (4 March 1991), http://hansard.millbanksystems.com/commons/1991/mar/04/prevention-of-terrorism#column_31 (last accessed 30 October 2011). HC Library Research Paper 98/65 (15 June 1998). Northern Ireland: The Release of Prisoners, under Northern Ireland (Sentences) Bill. For example the taking away of political prisoner status and resulting Hunger strikes. CAB/129/180/14 C(74) 139 copy no 80 (24 November 1974) “I.R.A. Terrorism in Great Britain”, Memorandum by the Secretary of State for the Home Department”, available via http://www.nationalarchives.gov.uk/documentsonline/. Chairman: The Viscount Colville of Culross, Q.C. (July 1990, Cm. 1115), ISBN 0 10 111152 5, available from http://cain.ulst.ac.uk/hmso/colville.htm (last accessed 10 January 2011). James Gray, HC Deb 16 March 1999 vol. 327 cc1003-1004, http://hansard.millbanksystems.com/commons/1999/mar/16/prevention-of-terrorism#column_1004, (last accessed 30 October 2011). Some measures specifically for Northern Ireland continued temporarily, further constructing a distinction between “Irish” and “other terrorist” theats. For example the Anti-Crime, Terrorism and Security Act 2001, Prevention of Terrorism At 2005, Terrorism Act 2006, CONTEST strategy, new government departments (such as the Joint Terrorism Analysis Centre and National Extremist Tactical Coordination Unit), and expanded resources and jurisdiction for law enforcement. Related to these expanding institutional features was an expansion of legislation more generally by the Labour government. While there is insufficient space to go into this broader shift in governance strategy here, an initial observation is that even if legislating was more common, that would not on its own necessarily explain how temporary counterterrorism legislation opposed by Labour for so long would then be made permanent. Even if legislating was deemed necessary, different criminal or security legislation could perhaps have been enacted that was not dependent upon threat constructions related to “terrorism”. “anti-terrorism laws have led to some of the worst human rights abuses in this country over the past 25 years, contributed to miscarriages of justice and have led to the unnecessary detention of thousands of innocent people, most of them Irish” (Wadham, John. Reply to Straw. (14 December 1999) ‘No, you’re turning us all into criminals,’ Guardian p. 15. For example the Birmingham Six and Guildford Four in the 20th century, or Jean Charles de Menezes in the 21st. See Marie Breen-Smyth for further research around issues pertaining to victims of violence and the role of communities. Complications of trust between policing and marginalized communities along identity boundaries can be an issue in a variety of contexts. For an example of similar tensions exacerbating insecurity in Paris suburbs, see Cathy Lisa Schneider, “Police Power and Race Riots in Paris”, Politics & Society (March 2008), 36 (1): pp. 133-159. Jack Straw, HC Deb 30 Oct 1997, “Counter-terrorism Legislation”, via http://www.publications.parliament.uk/pa/cm199798/cmhansrd/vo971030/debtext/71030-05.htm#71030-05_head0 (last accessed 11 January 2011). See Research Paper 99/101. (13 December 1999) “The Terrorism Bill”. Bill 10 of 1999-2000. House of Commons Library, available from, http://www.parliament.uk (last accessed 2 December 2010), and “Legislation Against Terrorism” (Cm1478). “Yoking” (Abbott 1995) captures when identity constructions reposition boundaries to reallocate who are legitimate and illegitimate actors. Townshend 28-29, HC Deb v.170 cc244 (27 March 1990), http://hansard.millbanksystems.com/commons/1990/mar/27/adjournment-easter-and-monday-7-may#column_244. “It is deplorable that after attacks on innocent citizens in this country a fund-raising organisation remains in existence in the United States and is generously supported by many American citizens. Is the Leader of the House aware of our strong approval of the words of the United States ambassador in describing as contemptible the acts of the Mayor of New York who has seen fit to name a street in New York after a convicted IRA terrorist?” Lord Harris of Greenwich, HL Deb vol. 520 cc1459 (26 June 1990) http://hansard.millbanksystems.com/lords/1990/jun/26/carlton-club-bomb-incident#S5LV0520P0_19900626_HOL_172, last accessed 30 October 2011. L Deb 17 July 1990 vol. 521 c823, http://hansard.millbanksystems.com/lords/1990/jul/17/the-defence-estimates-1990#S5LV0521P0_19900717_HOL_157 (last accessed 30 October 2011). In addition see the often-discussed South Africa-Northern Ireland connection often referenced in debate, HC Deb vol. 209 cc369-420, (10 June 1992), http://hansard.millbanksystems.com/commons/1992/jun/10/northern-ireland-prevention-of-terrorism#S6CV0209P0_19920610_HOC_355 (last accessed 30 October 2011). Jackson, Richard, Lee Jarvis, Jeroen Gunning and Marie Breen Smyth (2011) Terrorism: A Critical Introduction Basingstoke: Palgrave Macmillan, p. 3. Similarly see Campbell (1998) on how discourses of danger help constitute both the need for, and substance of, foreign and security policy. CAB/129/207/4 C(79) copy no 81 (30 August 1979) “Northern Ireland: Security, Memorandum by the Secretary of State for Northern Ireland and the Secretary of State for Defence”, available via http://www.nationalarchives.gov.uk/documentsonline/. CAB/129/180/14 C(74) 139 copy no 80 (24 November 1974). Not the UK Human Rights Act 1998 was an important move in this regard, see also section 5.10-5.11, Research Paper 99/101 (13 December 1999) “The Terrorism Bill”. Bill 10 of 1999-2000. House of Commons Library (citing Lord Lloyd’s Report “Legislation Against Terrorism” (Cm 4178), available from http://www.parliament.uk (last accessed 2 December 2010). See, for example, HC Deb vol. 799 c1546 (16 April 1970 ), http://hansard.millbanksystems.com/commons/1970/apr/16/northern-ireland-civil-disorders#S5CV0799P0_19700416_HOC_8 (last accessed 30 October 2011). Roy Hattersley, HC Deb vol 204 c. 696 (24 February 1992), http://hansard.millbanksystems.com/commons/1992/feb/24/terrorism#S6CV0204P0_19920224_HOC_214 (last accessed 30 October 2011). Rather ironically, this permanence stems from measures that were indeed legitimated through a commitment to their explicitly temporary position. Explained by Townshend, “the promiscuousness of the terrorist label had by the 1970s robbed it of any precision or analytical value” (23). An exception noticed in debate archives during the 20th century was with reference to Rhodesia. http://hansard.millbanksystems.com/search/terrorism?century=C20 (search last performed 30 October 2011). http://hansard.millbanksystems.com/search/terror?decade=1990s (search last performed 30 October 2011). HC Deb vol 181 c.24 (19 November 1990 ), http://hansard.millbanksystems.com/commons/1990/nov/19/northern-ireland-emergency-provisions#S6CV0181P0_19901119_HOC_201 (last accessed 30 October 2011). HC Deb vol. 317 c.748 (02 September 1998), http://hansard.millbanksystems.com/commons/1998/sep/02/criminal-justice-terrorism-and#S6CV0317P0_19980902_HOC_225, (last accessed 30 October 2011). See Hall and Jackson (Eds.) 2007 for more on issues of “civilizational identity” in different research contexts. HC Deb vol. 273 c.1154 (14 March 1996), http://hansard.millbanksystems.com/commons/1996/mar/14/prevention-and-suppression-of-terrorism#S6CV0273P0_19960314_HOC_307 (last accessed 30 October 2011). HC Deb vol. 291 c927 (05 March 1997 ), http://hansard.millbanksystems.com/commons/1997/mar/05/prevention-of-terrorism#S6CV0291P0_19970305_HOC_305 (last accessed 30 October 2011). Hickman, Mary J., Lyn Thomas, Sara Silvestri, and Henri Nickels. (2011) “‘Suspect Communities’? Counter-terrorism policy, the press, and the impact on Irish and Muslim communities in Britain.” Report of a research project: A comparative study of the representations of ‘suspect’ communities in multi-ethnic Britain and of their impact on Muslim and Irish communities 1974-2007. ESRC, RES-062-23-1066, http://www.londonmet.ac.uk/research-units/iset/projects/esrc-suspect-communities.cfm. (last accessed 30 October 2011). Tilly, Charles. (1998) Durable Inequality. Berkeley: University of California Press. CONTEST: The United Kingdom’s Strategy for Countering International Terrorism (2006, http://www.webarchive.org.uk/wayback/archive/20060831120000/http://security.homeoffice.gov.uk/news-and-publications1/publication-search/general/Contest-Strategy.html); CONTEST 2009 Review (http://www.official-documents.gov.uk/document/cm78/7833/7833.pdf, last accessed 31 October 2011): The United Kingdom’s Strategy for Countering Terrorism (2011, http://www.official-documents.gov.uk/document/cm81/8123/8123.pdf, last accessed 31 October 2011).